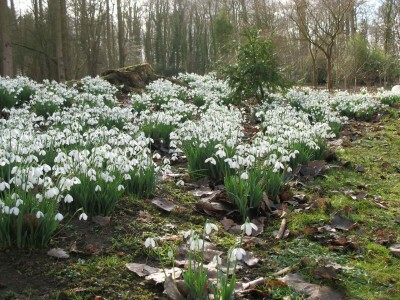 I have been on my first visit to a ‘snowdrop garden’ today, to Evenley Wood Gardens near Brackley, Northants. Although I’m not a ‘galanthophile’, ie someone who appreciates all the different varieties (and there were 80), I now realise why visiting a garden this time of year is attractive. The quiet – visually as well as audibly – of a grove of long straight trunks of birch, for example, with the greys and browns of dead leaves and mud underfoot – makes the spreading masses of snowdrops more startling, and more to be appreciated. The garden is 60 acres of woodland, with many unusual trees and woodland plants. It’s a nice place to enjoy a walk in, with intersecting paths, streams with little plank bridges, and a few ‘bus shelter’-like structures for sheltering from the rain. The day was sunny and mild – ideal (for a change). As well as snowdrops there were a shining mass of aconites on a bank, and some lovely areas where cyclamen grew, glowing softly in different shades of white, pink and mauve. I didn’t see many hellebores, but there was one unusual variety: helleborus hybridus ‘Harvington Yellows’, which had creamy-yellow flowers. Another highlight was a lovely fan-shaped witchhazel shining in the sun. The other plants augured well for more visits during the year. As the centre of the wood is acid clay (very unusual for round here), acid-loving plants such as rhododendrons can be grown. I saw these and many little azaleas, a ‘camellia walk’? and magnolias too. So I’ll be back! The gardens are open every weekend between March 19th and July 17th as well as Bank Holiday Mondays, and also open for ‘autumn colour’ on 29th and 30th October. There’s a Rare Plant Fair in April and Lily Festival in July. See the website for more details – www.evenleywoodgardens.co.uk. This is not so much a ‘garden’ like Beth Chatto’s, with plant combinations and beds, more of a wood, an arborist’s paradise punctuated with other beautiful plants, and a lovely place for a walk. And of course tea and cakes. Privately-owned, it’s a labour of love. Dear Jane, This looks like exactly the kind of spring garden which I should love to visit. The woodland walk that you highlighted looks very pretty indeed and, as you say, there is nothing quite like seeing these natural drifts of plants to raise the spirits on these dreary days. I have noted this garden as I have never heard of it before, so thank you for the introduction. Thanks for the comment – it was a lovely wood on a sunny day for a change. I have just discovered this wood myself. As it’s not National Trust and not publicly owned forest, there isn’t much publicity for it. I’m looking forward to seeing it in the spring (magnolias) and also with the azaleas. Thanks for noticing the post and being so diplomatic about the layout! What a beautiful-sounding place. I love woodlands at any time of year, but I agree that there is something particularly lovely about the quality of peace you get when things are only just starting up again for the new season. It is also, in my opinion, the best setting to enjoy large drifts of snowdrops and cyclamen. So much better than in a garden – not that I will stop growing them myself! Thanks for dropping by my blog.